So what is the problem? The problem is that how ever much oil there is hidden under Greenland by the year 2000 half of the oil and coal has already been consumed, (lets just presume this is true) and we can do many things with modern technology, but we can't make more oil or coal and we still can't capture the suns energy as efficiently as plants do. The two problems that my location has from a hydroelectric point of view are no head, (which is why I mentioned it at the start) and a massively variable flow rate. So why is this a problem? If you are not scared off by terms like volts and amps then you can probably let me run with the idea that the head is equivalent to ampere-hours and the flow rate is equivalent to the watts. ( For this note we just need to think: amps * volts = watts ). So with this undershot design we are dependent on the flow rate. So the variable rate problem is not too hard to solve: bicycle gears - simply employ a gear system that engages higher gear ratios between the turbine and the generator as the turbine velocity increases. But that is only half of the story. If you inspect my proposed site the water level can vary by over a meter, (from zero in summer.) The stream is full of a range of limestone rocks/pebbles and every the occasional boulder. The stream is insized and creating a water chase is beyond the scope of this project. 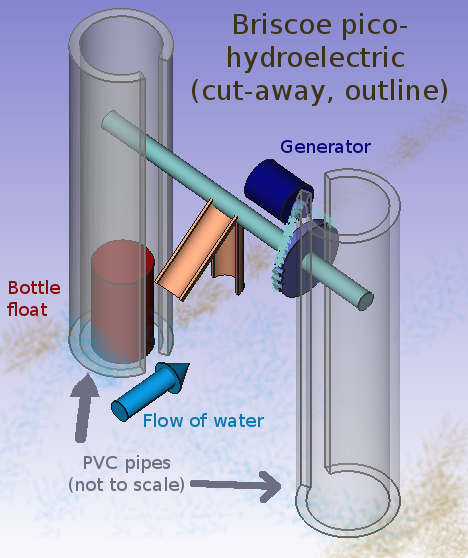 The solution that I came up with uses two vertical PVC drainage pipes with empty two liter polyethylene terephthalate drinks bottles inside. The bottles act as floats upon which the rig, (turbine and generator on a frame) can balance. The vertical pipes are resessed into the sides of the stream, (it is less than two meters wide) with a vertical slot cut into the face of each. As the water level rises the bottles float up and lift the rig. This means that as the flow rate increases the contraption is lifted clear of the rocks that are moving along the bottom. This protects the blades of the turbine, and though it sacrifices some of the energy of the stream, we are still in contact with the part of the flow with the least friction from the sides and bed of the stream. This all looked good when I sketched it up in freeCAD but with some rough calculations the rig was going to be too heavy. The first amendment was easy: a cable connected inside the PVC verticals to the rig. This ran to the top of the verticals, over a pully and down the outside to a counterweight. This counterweight ended up being a steel sleeve that wrapped round most of the vertical, (this kept is tidy and accessible to raise the rig for maintenance. Originally the blades of the turbine were made from plastic guttering, but to experiment with shape we had a set that we made from wood. This changes the weight of the rig, but with the location of the counterweight it was easy to tack on pieces of lead to correct the required mass. Now I just have to finish the automatic gearing and measure the useful current.